Xponent gig bag, Bag for DJ from M-Audio. The Torq Xponent Gig Bag is now available exclusively through the M-Audio online store. To celebrate the launch, they’re offering a limited-time 15% discount. Just click the “Buy Now” button and enter coupon code 15OFFBAG during checkout. 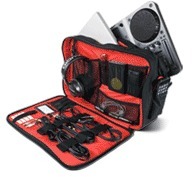 The M-Audio® Torq® Xponent Gig Bag is the perfect carrying case for today’s mobile DJ. Padded sleeves protect your gear while the high-contrast orange interior makes things easy to find in low-light conditions. Separate compartments for the Xponent® control surface, a laptop and the necessary accessories means quick access to everything you need for a night in the club. Built-in cable management prevents the dreaded ball of wires. 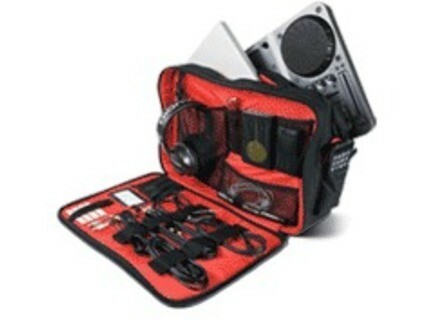 Front-compartment mesh pockets accommodate headphones, hard drives, flashlights and MP3 players. With a rugged nylon shell and high-density stitching, the Torq Xponent Gig Bag is built to withstand the rigors of life on the road. Coupon valid through 12/31/2008 and available only while supplies last. Ion Audio U Cast podcast kit Ion Audio release the U Cast podcast kit.